Today's Dietitian sits down with Hope Warshaw, the 2016 immediate past-president of the American Association of Diabetes Educators, to discuss the organization's work, the RD's role in diabetes care, and ways dietitians can be most effective in delivering diabetes care, education, and support in the future. Hope Warshaw, MMSc, RD, CDE, BC-ADM, FAADE, is a nationally recognized dietitian and certified diabetes educator (CDE) well known for her expertise in diabetes management. She applies nearly 40 years of experience in her work as a book author, freelance writer, media spokesperson, consultant, diabetes educator, and weight management coach in her business, Hope Warshaw Associates, LLC (hopewarshaw.com). Warshaw has written several award-winning, best-selling consumer books and resources published by the American Diabetes Association, including Eat Out, Eat Well — The Guide to Eating Healthy in Any Restaurant, Diabetes Meal Planning Made Easy, and The Complete Guide to Carb Counting: How to Take the Mystery Out of Carb Counting and Improve Your Blood Glucose Control. She's a contributing editor, freelance writer, and editorial advisory board member for Diabetic Living, a consumer diabetes magazine and website. Warshaw also writes the Nutrition Q&A column for The Washington Post. As the 2016 president of American Association of Diabetes Educators (AADE), Warshaw successfully launched and promoted the organization's new 2016–2018 strategic plan in partnership with its board of directors and CEO. To communicate the plan's key messages, Warshaw identified individuals she refers to as "Change Champions," role models in the field who personify the very essence of the six key strategies in the strategic plan. She profiled each Change Champion in six of her president's messages published throughout the year in AADE in Practice, AADE's practice magazine. In her president's address at the AADE 2016 annual conference, Warshaw identified additional Change Champions and further threaded this Change Champions initiative to drive the strategic plan and messages centered on role models. Today's Dietitian (TD): Can you provide a brief overview of AADE and its membership? Warshaw: Based in Chicago, the AADE is an interdisciplinary organization that was begun 40 years ago by a handful of nurses who were delivering diabetes education and who wanted to form an organization in which they could share and connect with each other. Today, the AADE has nearly 15,000 members, of which 50% are nurses or nurse practitioners, one-third are RDs, and the remainder are mainly pharmacists, behaviorists, and exercise physiologists. About 60% of AADE members hold the CDE credential. TD: What issues in diabetes care and education is the AADE most involved with today and will be in the near future? • evolving models of care and delivery. Diabetes educators are increasingly transitioning their practices, traditionally provided in outpatient hospital facilities, into primary care practices and other newer models of health care delivery. Diabetes educators are taking on new roles such as care coordinators, trainers for diabetes paraprofessionals in train-the-trainer models, and managers of quality control. TD: The prevention or delay of type 2 diabetes has become a focal point for the Centers for Disease Control and Prevention (CDC) and Medicare. In November 2016, the Centers for Medicare and Medicaid Services (CMS) released the final regulations1 for the Medicare Diabetes Prevention Plan (DPP) benefit, which is scheduled to go into effect in 2018. How is AADE involved, and how are RDs engaged in this work? Warshaw: AADE has been integrally involved since 2012 as a CDC grantee to carve out a model of delivery for the National DPP. We've developed a model2 in which the DPP program is delivered within existing Diabetes Self-Management Education and Support (DSMES) programs. Because the core focus of the DPP is on losing 7% of body weight and keeping lost weight off, healthier eating and physical activity are important elements of the program. And RDs are directing or supervising diabetes paraprofessionals in AADE's DPP model. I would suggest to RDs interested in working in a DPP program to obtain the lifestyle coach training. This training is required by program instructors. Before obtaining this training, they should identify a physical or virtual program (or combination program) in which they can offer their services and/or serve in a program management role. In addition, RDs who work within a health care system, health plan, or state-based public health organization can advocate for the addition of a DPP program to the services offered. TD: Along with the obesity epidemic, there's an epidemic of type 2 diabetes. How can RDs maximize their role in delivering adequate MNT and DSMES to these individuals? Warshaw: Whether delivering MNT or DSMES, diabetes educators need to drive the message that education and ongoing support is a critical piece of care that must be integrated with the use of medications and sufficient physical activity. Type 2 diabetes is progressive. The way you manage a progressive disease is to diagnose it early and offer education progressively as well as progressively manage other elements of therapy, typically medications. To me, the most important message dietitians involved in diabetes care can deliver to the public at large and individuals they counsel is the importance of losing a minimal amount of weight at diagnosis. We know that if you're overweight or obese the literature says that losing that 5% to 7% of weight from your original weight can have dramatic effects on glucose control and other aspects of management, such as hypertension and dyslipidemia. That weight loss can dramatically lower glucose, reduce blood pressure, improve lipids, increase mobility, decrease sleep apnea, etc. TD: Beyond becoming CDEs, what other certifications or skill sets can RDs obtain to stay current and provide quality care? • lifestyle coach training offered by the AADE, which is required to deliver the National DPP for the CDC. • Glucose lowering and other commonly prescribed medications. RDs working in the field must be able to make medication recommendations, or at least be a person's advocate and ask the provider, "Does it make sense to change the dose of or prescribe X, Y, Z?" • Technologies and devices, particularly insulin pumps and glucose meters. We're seeing more and more continuous glucose monitors being used. There's a huge amount of data that these devices are providing to people. Educators can increase their skills in knowing what devices to recommend and how to analyze and use those data to evolve and improve care. • Technologies surrounding telehealth where RDs can use the technology to frequently connect with people who have diabetes. The research has shown that if we're really going to help move the needle with people being able to permanently change their behaviors and improve their diabetes care, they need frequent and continuous contact. To think that we could deliver that in person on a one-time visit or a couple of visits per year is just not reality. TD: What resources do you recommend to RDs to help them stay up to date with the ever-changing field? Warshaw: One resource I use regularly is a consumer website called diaTribe.org. Sign up for their free e-newsletter. Another is the daily blog Diabetes Mine. Both tend to be technology- and type 1 diabetes-focused, but they cover the whole terrain. TD: You've been very much engaged in social media and building bridges among people with diabetes and diabetes educators. Can you give an example of how RDs can engage in social media to start building these bridges? Warshaw: Through social media, we as educators can learn more about the needs, wants, and desires of people with diabetes at a real human level. Initial ways RDs can engage are in Twitter chats among people with diabetes, such as the weekly Diabetic Connect (#DCDE) or the DSMA chat (#DSMA). Just lurk and observe the interaction. What are some of their pain points? What are some of their needs? What kind of information are they sharing about practical diabetes management? 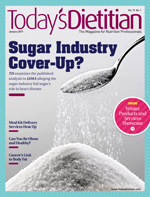 TD: You've done much writing about diabetes and nutrition for consumer audiences. Why do you think it's so important to have RDs writing for consumers? Warshaw: It's critically important that we get our voices heard and that we're committed to getting the accurate science out. We have evolved into an information overload society. It's almost as if we as the health care providers have been removed because people go directly online for their health care information searching whatever they want. We aren't going to squelch misinformation, but if more of us write and put accurate information out, maybe we can increase the odds of people getting credible, actionable information and utilizing it. — Andrea N. Giancoli, MPH, RD, is a nutrition communications consultant in Hermosa Beach, California. 1. Centers for Medicare & Medicaid Services, Department of Health and Human Services. Medicare Program; Revisions to Payment Policies under the Physician Fee Schedule and Other Revisions to Part B for CY 2017; Medicare Advantage Bid Pricing Data Release; Medicare Advantage and Part D Medical Loss Ratio Data Release; Medicare Advantage Provider Network Requirements; Expansion of Medicare Diabetes Prevention Program Model; Medicare Shared Savings Program Requirements. Fed Regist. 2016;81(220):80170-80562. 2. DiBenedetto JC, Blum NM, O'Brian CA, Kolb LE, Lipman RD. Achievement of weight loss and other requirements of the Diabetes Prevention and Recognition Program: a National Diabetes Prevention Program network based on nationally certified diabetes self-management education programs. Diabetes Educ. 2016;42(6):678-685.